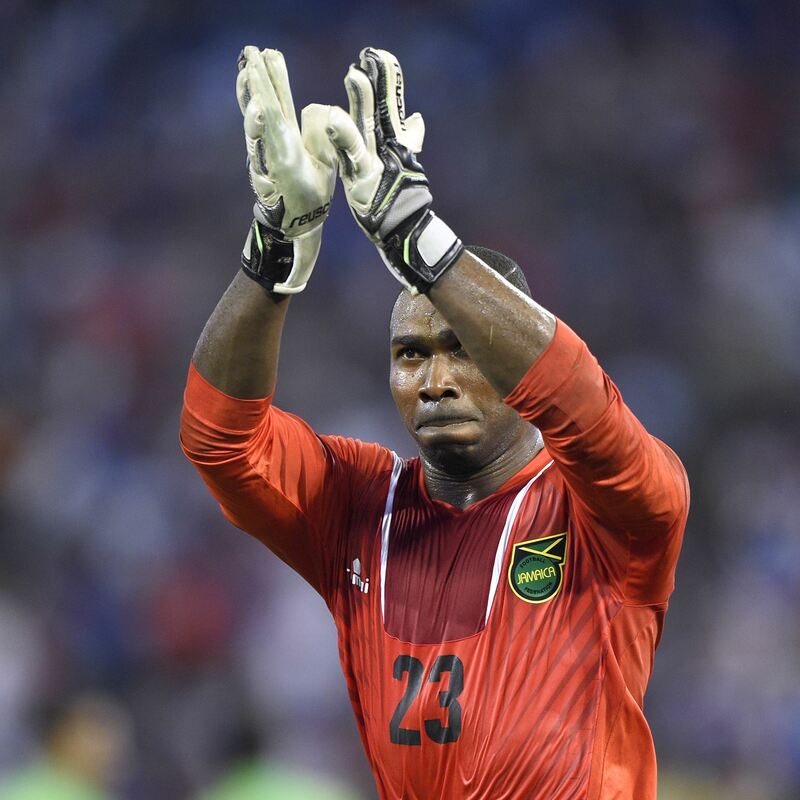 Riverhounds goalkeeper Ryan Thompson will be in Philadelphia tonight trying to help Jamaica win their first ever CONCACAF Gold Cup. It’s a momentous Sunday for soccer in Pennsylvania. 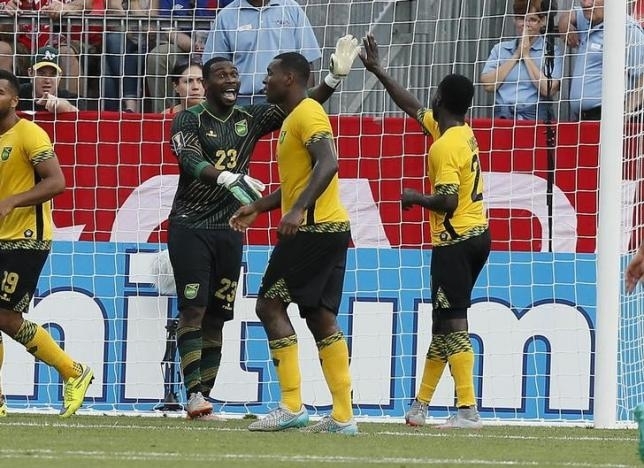 The Finals of the CONCACAF Gold Cup tournament will be played this evening at Lincoln Financial Field in Philadelphia between Mexico and the surprise Jamaican team — that has been led by Pittsburgh Riverhounds goalkeeper Ryan Thompson. Before that, about a hundred plus miles to the West, we’ll have the third edition of what has been a very an already thrilling series of Keystone Derby matches this year. Pittsburgh Soccer Report’s John Krysinsky’s previews what promises to be quite the double-dose of soccer in Pennsylvania this evening. Sunday, July 26, 6:30 p.m. 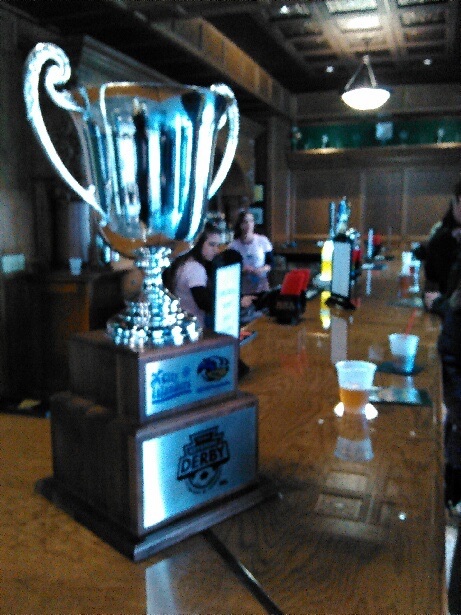 The Turnpike Cup made its debut in the Riverhounds’ sports pub at Highmark Stadium in March. Harrisburg’s form has been sluggish lately after a strong start to the season. The Islanders have won twice in the past nine outings. Head coach Bill Becher will be without Dante Leverock on Sunday after the Bermudan defender was sent off during last Saturday’s 2-0 loss to the New York Red Bulls II. Only Rochester’s Brandon Miller and Louisville City’s Scott Goodwin have recorded a greater number of shutouts than Harrisburg goalkeeper Nick Noble despite the Hounds putting 11 goals past the West Virginia University graduate in two games. 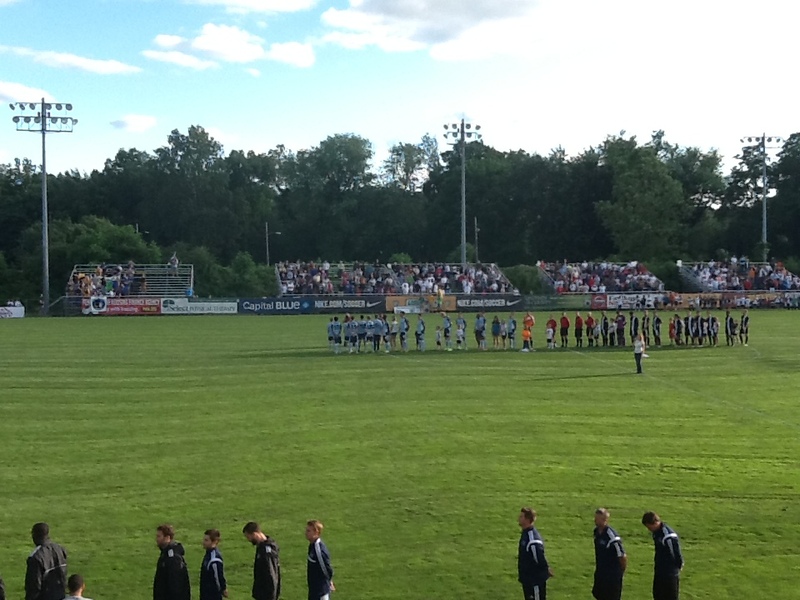 The Riverhounds-City Islanders provided plenty of drama in their first two matches this year. Pittsburgh won both previous encounters in dramatic fashion at Highmark Stadium. Kevin Kerr’s hat trick prompted a 5-2 win in the season opener on March 28. Kerr then capped a dramatic comeback for the ages on May 30 – better known in these circles as the “Miracle on the Mon” — when the Hounds recovered from a 5-3 deficit in the final minute to win 6-5. How do you top what happened at Highmark Stadium on May 30? The two teams will have a lot on the line on Sunday — as this will be the first of two more meetings this season with playoff implications — and a chance to take the prized Turnpike Cup. A tie will be enough to ensure that the Hounds will be presented with the inaugural Keystone Derby Cup in Harrisburg after the final USL regular season meeting between the teams on Sept. 19. “LSunday’s game also carries huge implications for the Eastern Conference’s top six playoff places. 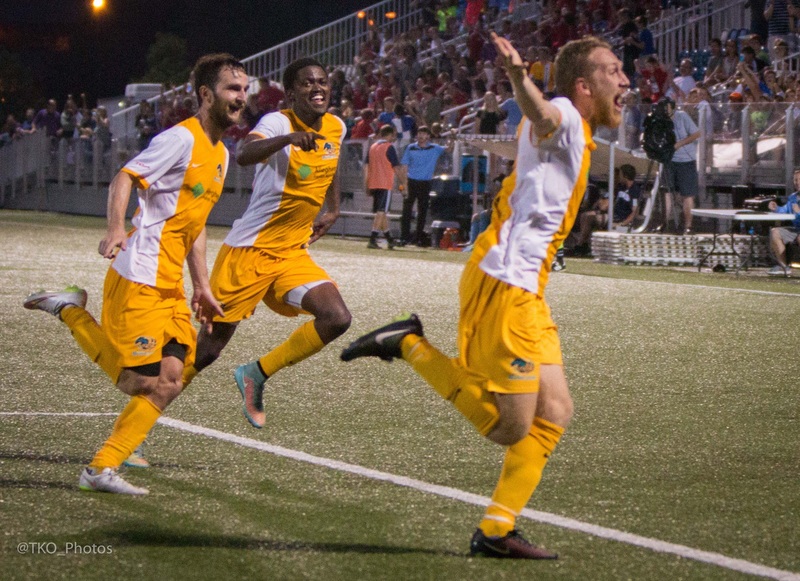 The Hounds are tied for fifth in the standings with the New York Red Bulls II after dropping the past two games to F.C. Montreal and Louisville City. Harrisburg sits two places back with a 6-6-4 record (22 points) having played two fewer games than the Hounds. Rob Vincent’s assist for Kerr in last week’s defeat to Louisville kept him second in the USL scoring categories for points and points-per-game as well as goals and goals-per-game behind Oklahoma City Energy’s Danni Konig. Kerr is tied third in the league for assists along with Harrisburg’s Enric Valles. Head Coach Mark Steffens has some injuries to contend with this weekend. Defenders Sterling Flunder and Drew Russell are dealing with sprained knee ligaments while Fejiro Okiomah has an Achilles problem that will likely keep him sidelined. Brazilian forward Vini Dantas is also out with a heel contusion. The City Islanders are struggling. So are the Hounds. With both fighting for positioning on the playoff line and with the Riverhounds needing just a point to pretty much clinch the Derby — this should be a hard fought contest. It will also be interesting to see if both teams play cautiously in the early going — and make defending a priority. And from what we’ve seen so far in their first two encounters — anything is possible. I took a look at the Hounds struggles a bit in my column earlier this week — addressing the primary concern being are they too reliant on Kevin Kerr and Vincent, who’ve made up nearly 65 percent of the team’s offensive output this year, and can the duo keep their scoring pace? Without more support in the attack they won’t be able to. And without defensive lapses they won’t be able to either. The past two Riverhounds losses were plagued by poor starts that included mistakes in the back. If you recall, in the first half of the last outing, Harrisburg really looked formidable in the first half, not giving an inch to the Riverhounds attack — and capitalizing on mistakes to take a 3-0 lead at halftime. Even as the Hounds were making their comeback, they still had more miscues in the 2nd half. But the supporting cast really stepped up (Lebo Moloto with USL record three assists, Amara Soumah’s speed and Danny Earls was man on the spot for two big goals) in the comeback. The Hounds will need this type of effort to be a contender all the way through their remaining 10 games — starting tonight. Skyline Sports Complex field is a complete 180 from what the Hounds play on at Highmark Stadium. Instead of the field turf that the ball moves very quickly on, the City Islanders play on a very thick, high grass that will take some getting used to. In their only game at Harrisburg last year — the two teams played to a 0-0 draw. The Hounds, who were one of the worst teams in the league at that point a year ago, had the better of play but couldn’t convert. This will be a match of two teams that have reached the final taking very different paths. Here in Pittsburgh — we’ve watched closely as goalkeeper Ryan Thompson — who plays for the local Riverhounds – has had a storybook run to help get his team to the finals after coming on in the 20th minute of their final group stage match to shut out El Salvador. After a 1-0 clean sheet over Haiti, and then shocking the U.S. on Tuesday, Thompson now faces a Mexican team that has made their way to the finals via some controversial wins aided by penalties in their favor over Costa Rica in the quarterfinals and Panama in the semifinals. Should Jamaica win, it will mark the first time a team other than the US, Mexico or Canada lifts the cup. If Mexico wins — it will be their record seventh Gold Cup title. The United States didn’t deserve to win on Tuesday with a mostly ragged performance, but they still held possession for long stretches and Thompson was under pressure. In a few instances, he had some shaky moments, but he persevered. In one sequence in the first half, a ball that was played back to him, Thompson took an extra touch, allowing U.S. forward Aron Johannson to close in and almost steal a goal — hitting the outside of the left side of the net. In the second half, Michael Bradley sent an absolute stinger right at Thompson. Thompson didn’t seem to react to the shot right away, but it went right off him — and hit the post to his right and bounced away. But Thompson also made a few spectacular stops as well — including one diving save on Fabian Johnson and another where he out-muscled Clint Dempsey for a ball on the ground. The veteran goalkeeper has had quite a career playing at many levels — here’s a nice feature on him on FIFA.COM today. And he’s certainly been carrying the flag for the USL, as you can see by the support he’s received on their website — chronicling twitter reaction to his win over the U.S.
MEXICO NOT AT FULL STRENGTH? LA Galaxy forward Giovani Dos Santos continues to have issues with his left abductor, and Jonathan Dos Santos and captain Andres Guardado was also injured in the semifinal too. .
There’s some, uh, controversy surrounding Mexico these days. Maybe you’ve heard. But it’s not just the refereeing that has people wondering about Mexico. Their play hasn’t exactly wowed, and that means crushing pressure on Mexican Coach Miguel Herrera. “Now I’ve spoken with the boys – we all saw that the game wasn’t a good one and we were all conscious of that,” Herrera said.